1.4.3 What Is Servlet In Java? 20.10 Why Collections Are Generic In Java? You have exceeded the limit to read number of knowledge chapters/per hour. Please login/signup below to continue reading. For unlimited access to MeritCampus knowledge chapters, upgrade to premium membership. You have exceeded the limit to read number of knowledge chapters/per day. Please login/signup below to continue reading. You have exceeded the limit to read number of knowledge chapters/per hour. You have exceeded the limit to read number of knowledge chapters/per day. 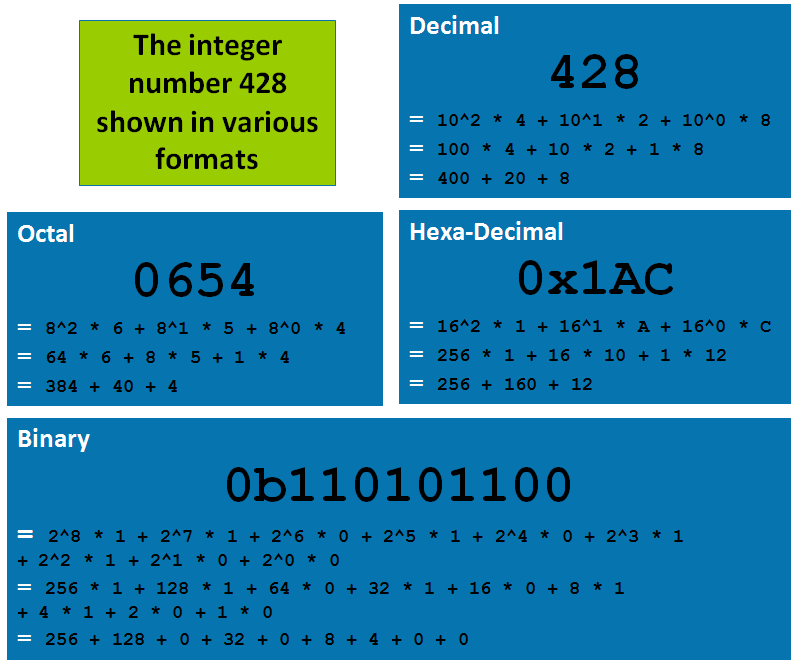 We can specify the integers either in decimal, hexadecimal, octal format or binary format. To represent the type as long integer we use L or l as a suffix. We indicate a decimal format by putting the left most digit as nonzero. i.e. it is not prefixed with '0' or '0b' or '0x'. For hexadecimal format use the prefix '0x', and should be followed by digits 0 to 9 and from a to f.
Octal format should be prefixed with zero '0', and should be followed by the digits 0 to 7. We represent binary format as shown below, prefixed with '0b'. This is supported from Java SE 7 (Java 1.7). For long values suffix it with l or L.
For hexa-decimal long values suffix it with l or L and prefix it with 0x. The below diagram shows the conversion between various formats.